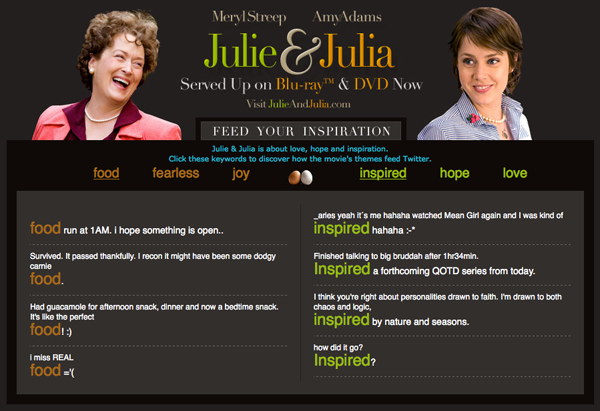 Julie and Julia - Feed Your Inspiration was a project I worked on while I was working for Sony Pictures. I was impressed when I saw that my next Twitter related project was going to be for the movie Julie & Julia. The client wanted dual twitter realtime streams that were similar to Twistori, that could be swapped with three alternative streams. They also wanted a box that the user could tweet from. I learned how to efficiently interact with JSONP based API's, and leverage caching solutions to prevent excess API requests.